Just because this is the view I'm constantly looking at while at my computer, and I had my camera handy, here's the top of my PC and the goodies that live there. From left to right there's a bootleg Saint Turtle figure, Yoda candy dish now a pencil (and sonic screwdriver) holder, small-scale unleashed Obi-Wan Kenobi, Mike figure, Mike lamp, small holographic Obi-Wans, and Jersey Devil. I find the lamp to be a particularly curious item, as it's basically an old bubble bath soakie with a lamp stuck through it. As much as I never thought I needed such an item, my desk is too dark without the secondary light, so I really can't function on my computer without it. Eric Talbot has updated his blog with this neato page full of Turtle (and Utrom!) goodness - Check it out! If I tried to tell you that I didn't collect lunch boxes it would only take one quick walkthrough of my apartment to call me a liar. Scattered around you'll find not only the occasional TMNT lunch box, but also Star Wars and Hello Kitty. But really, I'm not a lunch box collector. I am, however, a collector of "neat stuff," and over the years I have acquired a pile of lunch boxes that I've determined to fall into this category. All of the TMNT lunch boxes I've made a point of getting have one thing in common: Fantastic art. And, to my knowledge, art that is completely unique to them. Pictured above is a recent eBay acquisition; a lunch box featuring art by Michael Dooney. I also love this one because the lunch box style is so unique and not your standard box design. 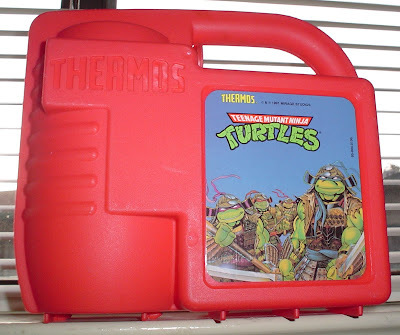 The other TMNT lunch boxes I have that I'm incredibly fond of feature art by Chris Allen and A.C. Farley. Perhaps I'll feature those in the future. 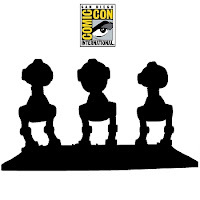 Ectopaul found this link, a Japanese Web site that seems to reveal that NECA will have an exclusive Mouser 3-pack for sale at San Diego Comic-Con this July. Murphy has previously revealed that there would be an exclusive boxed set at SDCC similar to the set that was for sale at New York Comic-Con, but with an additional accessory. So does that mean that there may be two exclusives in the works? We'll see if Murphy can confirm anything in the next day or so. 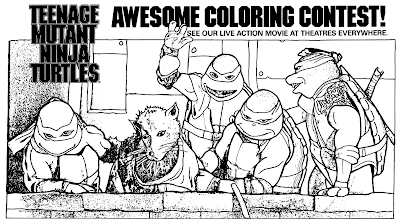 I found this piece in a promotional packet for the first TMNT movie. I find it particularly amusing because the transition from real picture to black and white line drawing wasn't completely successful. Mike and Raph don't look too horrible, Splinter just kinda looks sad, but both Don and Leo seem to have growths on their shoulders. If anyone wants to take a crack at actually coloring it, feel free to email your effort to me. eBay Auction: "The Hollywood Store"
Here's an interesting piece of art that has appeared on eBay. 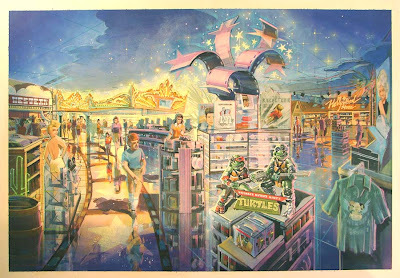 Titled "The Hollywood Store," I don't know what the intended use or purpose of this piece was (maybe there actually was such a store - wouldn't be much of a stretch), but amongst several familiar names and faces are two rock and roll Turtles (Mike and Leo, it looks like). Interesting that the artist would choose the Coming Out of Their Shells Turtles to depict... although more likely it was the first and/or only reference material they had to go by. Disclaimer: This is not my auction, I do not know the seller, and I cannot vouch for the seller. When TMNT hit movie screens last year, it was the green guys' fourth big-screen adventure, with a 14 year gap since the last one. You may or may not be aware that a fourth adventure almost came much sooner, in the form of a live action movie. Obviously that movie never happened, but it seems like production got further along that I ever expected it did. I recently purchased a 1996 Playmates toy catalog where to my surprise I found this page teasing this movie and the toys that Playmates intended to tie into it. Details of this proposed movie aren't well documented, but it is known that it was to involve a 5th Turtle, who would have been named Kirby (after Jack Kirby) - Concept sketches of Kirby can be seen in the front and back cover of Kevin Eastman's Artobiography book. This page uses Michael Dooney art created for the TMNT magazine (Fall '92 issue) with a Turtle-in-shadow also featured (I believe the shadow was created using a piece of Leonardo art, also by Michael Dooney, that was used as a pinup poster in the TMNT magazine). The Turtle-in-shadow would presumably be Kirby. The only plot hints given on this page, which don't include any talk of a 5th Turtle, are in the description of "a weird world of parallel dimensions and gothic proportions." Winter '96 is the given release date. 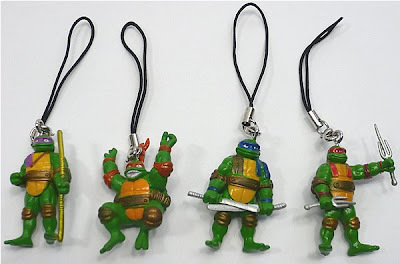 Here are some TMNT phone charms that I recently purchased from Japan (it'll probably be at least two months before I receive them, alas). This kind of item is often bootlegged, so it's hard to tell if these are official without holding them in hand. 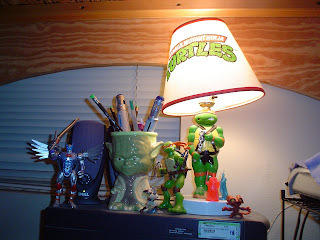 Whether or not they are official, these items appealed to me because they are obviously molded after drawings done by AC Farley, one of my favorite TMNT artists. NinjaTurtles.com actually used to use these drawings on the profile pages of each Turtle. You can also check out a back view and an alternate front scan. Yes, I'm going to shamelessly pimp my own auctions. 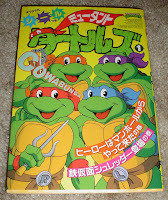 I just imported some of the TMNT manga that adapted episodes of the original cartoon and I'm selling the extras on eBay. When I describe these as super rare, I'm not kidding - I scour eBay every day for TMNT stuff, and I can't tell you that I've EVER seen these available before. Volumes 1-5 are up for auction right now! You can click here to view all of the auctions and bid! Good luck!